Being the tallest of dog breeds, the Irish Wolfhound is known to carry many height related names. Ideas can be found by researching names that mean tall in various languages or choosing the name of a tall athlete. Basketball stars like Lebron, Jordan, and Kobe provide a slew of interesting choices. Uzun (Turkish), Vysoky (Czech), and Pitka (Finnish) are a few name options that mean tall. As the name entails, the Irish Wolfhound was originally used to hunt wolves. Names can be taken from a famous wolf, werewolf, or even one of the Minnesota Timberwolves (combining with our first tactic). A few famous wolves from mythology include Amarok, Fenrir, Skoll, and Warg. Jacob, Embry, and Leah are wolves from the Twilight series. Since the breed originated in Ireland, no list of Irish Wolfhound names is complete without some good options related to Irish words and culture. Aidan, Hogan, and Murphy are a just a few Irish names that are increasing in popularity. Some of our pages will contain a subcategory. A subcategory is a slightly more specific grouping than the main topic of the page. For a subcategory, we will include a separated table of names and corresponding descriptions. An example of a subcategory of Red Dog Names would be 'Dog Names Inspired by Red Wines'. 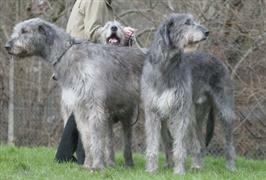 If you have any subcategory ideas for the Irish Wolfhound Names page, we would love to hear them. Use the form below to submit your ideas.